The result of many national plans since Independence is the grave political and social unrest that is facing us in the form of a very angry citizen near the bottom of the pyramid who for the first time can see the lives of the other affluent sections and the growing middle class played out in full colour in daily broadcasts of the television channels and the open access through the internet in an age of heightened communication. Access to communication brings transparency and raises aspirations for dramatic change. 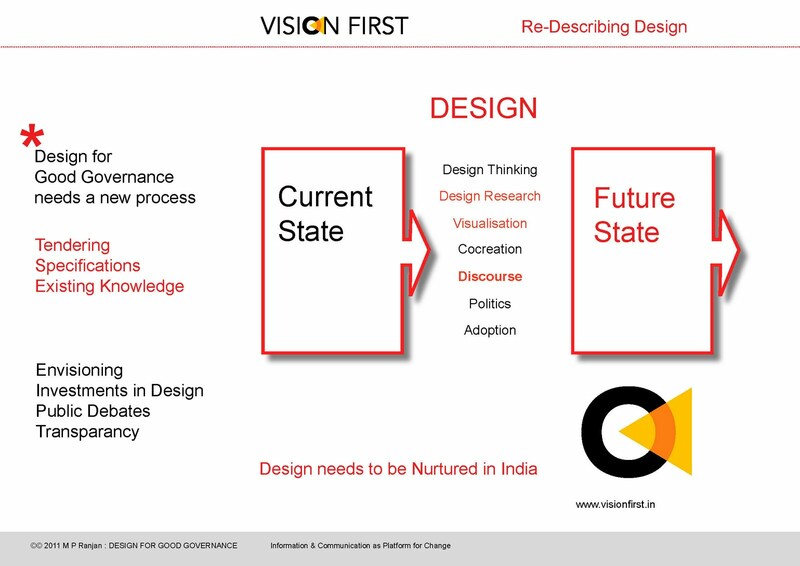 Charles & Ray Eames had warned us about this impending impact of such disruptive change through extended communication, a change in kind and not in degree they said, in their 1958 India Report based on which the National Institute of Design was set up in 1961. We have not paid heed to this sanguine advice it seems. They had called for the use of design to address the needs and aspirations of a people in the throes of such change but we have perhaps let slip an advantage by not channeling adequate investments to address their dreams and aspirations in close partnership with the people directly. The communication boom and an era of transparency have ensured that the Indian consumers are no longer willing to accept the mediocre which was often provided locally by the makeshift offerings popularly called “Jugaad”, when better value is now available. For example, in many parts of India the poor have shunned incompetent public education systems to place their child in more expensive private schools and in going the extra mile to avail quality where it is on offer, a new phenomenon for both urban and rural India that is communication enabled. No international design solutions are available that are ready and off the shelf to address the pressing problems of the Indian people such as affordable healthcare, rural and urban sanitation, dispersed quality education at the primary and secondary levels, agricultural and rural tools, rural housing and mobility and a host of other design opportunities across 230 sectors of our economy that are in crying need of design attention. These will have to be addressed locally and innovation and design will be the way forward but the infrastructure for action is not in place since the existing institutes are barking up the wrong tree it seems. There is a new form of design action that is being innovated ad applied which is not to be confused with the form giving activity of traditional industrial design and usability exercises, although it would include elements from the old form of design thought and action. Here we are proposing that the design action take into account the structure of society along with their macro aspirations, their histories and cultural preferences as a starting point and from here build imaginative approaches for products, services and systems that would include the meta-system, the infrastructure, the hardware, the software and the processware to ensure a perfect fit to the circumstances and requirements of the particular situation. This kind of offering is complex and would need a multitude of knowledge and skill sets to be brought to bear with sensitive social and cultural orientation and with a fine tuned economic and technical feasibility. Design for inclusive development is therefore a multi-disciplinary activity that needs to draw a variety of knowledge and skills in an innovative and future oriented setting that is well informed about the legal and the ethical parameters. In this form it becomes a powerful political activity since it is propositional in the manner in which it visualizes and presents several realizable alternatives for the stakeholders from which the process of selection and decision can begin in a climate of optimism and participation. It is a democratic activity at the very heart and gives power to the people who are at the location and to those who would be most impacted by its implementation. This shift in design thinking can be better understood through the model that I have proposed that explains the Three Orders of Design – Form, Structure and System – material & functional, aesthetic & socio-economic, environmental and political – all of which need to be addressed in all cases if we are to be assured of its sustainability and relevance to the local context. How do we create effective autonomous and decentralized action strategies and how do we roll this out across our country? This will be one of the central questions that can change the current impasse in development approaches dealing with poverty and development in many parts of India. The current conviction that we hold is the use of a macro-micro design strategy which has been developed after years of application. Use of design thinking will be at the heart of our strategy to try and achieve these innovative offerings. One particular form of thinking which is abductive thinking which is used by all those who eventually achieve new and path breaking approaches. This involves looking to the future with a search for potential possibilities and alternatives rather than analyzing past approaches to find mistakes to correct. In my view this kind of thinking (abductive) when combined with the action of visualization and building models that externalize the thought into tangible forms are at the base of the building of conviction and motivation that may be needed by communities of decision makers. The lecture will explore models for design thinking and share some useful metaphors to help grasp the complex ideas. This kind of thought is not the sole purview of the designer but the combination of this kind abductive thought with the action of visualization is the root of most break through innovations and inventions. The big question for me is how can we place this in the hands of many disciplines across the university and not let it remain in the realms of art and design centres and a few management institutes. Such action is also political in nature since the future focused act of building possibilities challenges current positions and comfort zones. Perhaps the myth of design thinking needs to be propagated so that all disciplines try their hands at this adrenalin creating kind of thinking with action and make it a part of their own method, a sort of sprinkling of the design salts into their own sets of tools. Download the visual presentation and abstract of my keynote lecture at the Jaypee Institute of Information Technology, Noida delivered last week as a pdf file from this link here.